U.S. officials are starting to hint that the Middle East’s borders could be redrawn. 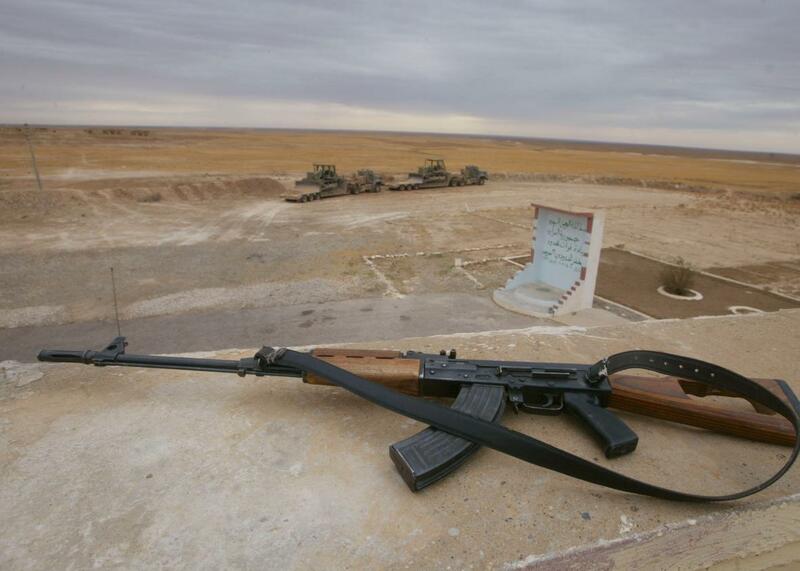 An Iraqi border guard’s AK-47 rests on the roof of a border fort next to the berm that seperates Iraq from Syria on Oct. 31, 2003. With growing uncertainty over the U.S.-Russia cease-fire plan that is due to go into effect this weekend, Secretary of State John Kerry assured the Senate on Tuesday that the U.S. has “Plan B” options if the cease-fire doesn’t work. He didn’t say what those were, but given how dismal the Plan A options look, they must really be something. With some notable exceptions, the U.S. is generally reluctant to support the redrawing of borders and neither Kerry nor Carter are exactly endorsing the idea. (Back in 2006, then-Sen. Joe Biden did advocate for a “soft partition” of Iraq along ethnic—Kurdish, Sunni, and Shiite—lines. The idea never went anywhere at the time, though it has gotten some re-examination since the emergence of ISIS.) But after five years of civil war and ethnic cleansing in Syria, the further weakening of the Iraqi state, not to mention the newly invigorated Kurdish nationalism in both countries, there seems to be a growing consensus that these states may no longer be sustainable within their current borders. So will changing the borders work? Simply redrawing the map along ethnic lines isn’t exactly a solution to the current violence. For one thing, there’s the uncomfortable fact that the dominant political force in many Sunni areas is currently ISIS. Dividing up the countries would be an extremely messy process that would likely spark yet more fighting over territory, and it’s unclear under whose authority this new regional order would even be negotiated. This isn’t 1919. Kerry isn’t Mark Sykes. But if irreparable damage has been done to these states, to the point that fighting to preserve them within their current borders is no longer a worthwhile goal, it’s time to start thinking seriously about what a map of the Middle East that avoids the pitfalls of the current one might look like. Perhaps we’ll learn more about it in Plan B.